For many people, keeping off the weight you’ve lost can be just as difficult as losing weight in the first place. Here are a few tips to help manage and maintain your weight. 1. Build lean muscle. The more muscle you have, the more calories your body will naturally burn, even when you’re at rest. 2. Eat filling foods. 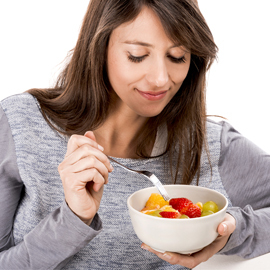 Avoid the need to overeat or eat between meals by eating foods that keep hunger away. Focus on lean proteins, fruits, vegetables and whole grains. 3. Keep temptation out of your home. You’re less likely to indulge if you keep your cupboards stocked with healthy snack alternatives and free of junk foods. 4. Watch your calories. Weight management is about balancing calorie consumption with calories burned. Continue to keep an eye on how many calories you’re eating to prevent regaining lost weight. 5. Practice meal planning. If you plan your meals in advance and shop accordingly, you’re less likely to end up in a drive-thru line or eating whatever you can find when hunger strikes. 6. Practice portion control. Chances are, part of your weight loss success came as a result of you eating smaller portions. This is a lifestyle change that will help you maintain your weight if you can keep it up. 7. Increase your exercise. Many studies suggest that it requires more physical activity to manage your weight than it does to lose it. As you build stamina and strength, look for ways to add to your exercise routine. 8. Weigh yourself daily. While not often recommended for dieters, daily weigh-ins can help you spot, and stop, weight gain as soon as it happens. 9. Add dairy to your diet. Studies show that people who eat at least three servings of low fat dairy per day are more likely to maintain their weight loss than people who only eat one or no servings. 10. Use your plate as a meal guide. Think of your plate as a pie chart – emphasis on the word chart. Fill at least half your plate with vegetables and split the remaining half between lean protein and whole grains. You’ve worked hard to reach your goal weight. Maintaining your weight is about reinforcing the new habits you’ve developed along the way.